My dentist wants to give me Zirconia Crowns on my front teeth. Is this a good idea? Zirconia crowns can look beautiful and very natural. Zirconia is an extra tough ceramic material, and it can be made extra thin. They have no metal in them, and can be made translucent or opaque, depending on the demands of the situation. 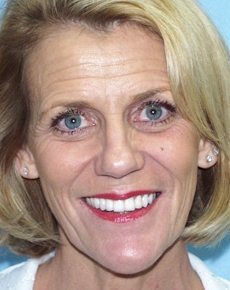 If they are bonded onto the teeth, and not just cemented with conventional dental cement, they won’t show a dark line at the gumline years later, the way porcelain fused to metal crowns do. 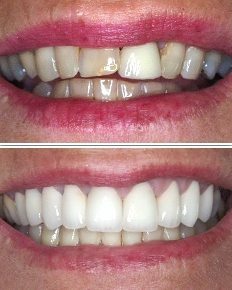 To show how beautiful they can look, here is a case from our recommended cosmetic dentist in Monmouth County, New Jersey, Dr. Peter Ciampi. For more information on Dr. Ciampi, click here. But, we need one important caution here when we talk about materials for crowns. Let your dentist pick the material. All of these materials have a learning curve to them, plus there are some dentists and dental laboratories that just don’t feel comfortable working with certain materials. There are many types of crowns that can give an absolutely gorgeous result. Pick a cosmetic dentist you can trust and then let him or her work with the materials they are comfortable with—don’t try to push them out of their comfort zone. I have heard that MAC veneers are the best looking available. Is that true, and should I tell my dentist that this is what I want? I have a discolored tooth from a root canal that was done 15 years ago. What can be done to make that one the same color as my other front teeth?